Amos is one of the best places you can go swimming in Marmaris. The road is quite tough, but it leads to a paradise. This fantastic bay is located in Kumlubuk on Turunc street, and it is famous for its ancient city above the sea. You can watch the sunrise and sunset from a different perspective on this hill. Amos is 25 km away from the town centre, and no excavation work has been done on it until the recent years. This lovely and small bay has a small pebble-beach and there is only one business running the place. If you get there early, you can find some space on the beach, otherwise it will be really crowded, because the sea and the beach is magnificent, and the landscape is incredible with lush trees. And there is a restaurant with delicious appetizers and pita. They have pretty much everything. Amos, which used to be one of the most important cities of Rhodes, means “The Temple of Mother Goddess” in Hellenic language. Apollo, who is known as Samnaisos in the Hellenistic period, is regarded as chief god of this city. The city, founded on a hill, was watched by 1,8 meter thick towers, and surrounded by 3,5 meter high walls. The most important surviving structure of the city is its theatre, which is located on a ground that sees the surrounding bay. There are terraces on the city, where you can see the sunrise and sunset. You can reach the theatre by climbing over the city walls from two sides. Amos, regarded as one of the most important settlements on the opposite shore of Rhodes, has been left untouched until recently. An excavation expedition led by Professor Dr. George Ewart found tenancy contracts from 200 B.C., which shows that the history of settlements in Amos dates at least back 2200 years. Have you ever visited Amos? Would you like to? Tell us with a comment, or better yet, get in contact with us for an excursion to Amos! 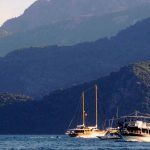 Is It Safe To Travel To Marmaris ? See our Accommodation page for the best places to stay in Marmaris. Our low rates & discounts will allow you to meet your budget. Just contact us through Live Chat, email or phone and we'll be there 24/7.